For over 60 years, NOTIFIER has been in a leadership position in the fire alarm industry. Today, they are the largest manufacturer of engineered fire alarm systems with over 400 distributors worldwide, and regional support operations on every continent helping to ensure they provide the flexibility and options your business needs. Their commitment to products and partnerships is what propels NOTIFIER to stand proudly above the rest. When you choose a NESCO-affiliated engineered systems distributor, you’re selecting more than a total-capabilities fire systems resource. You’re choosing a distributor whose expertise is tested and proven. In a fire emergency situation, seconds can mean the difference between a disaster and a controlled situation. Their newest technology, FlashScan™, addresses this issue, and helps solidify NOTIFIER’s position as the world leader in fire alarm detection. In the late 1980’s, NOTIFIER helped pioneer the intelligent market with the AM2020. 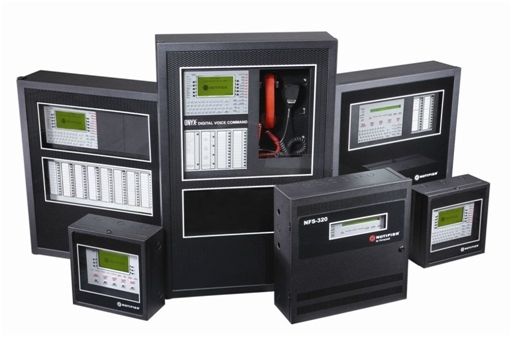 A host of quality products have followed in its footsteps, including other premier panels such as the AFP-200, and the AFP-400. All of the NOTIFIER Intelligent fire control panels have used a common communication platform, which they now refer to as CLIP (Classic Loop Interface Protocol). This method of communication polls each device individually, checking the status of each detector or module on a loop. Even though this platform has proved effective for years, NOTIFIER has pioneered the market with its patented FlashScan™ protocol. Using this revolutionary protocol platform, their FlashScan™ family of products can poll devices up to five times faster than before. Likewise, FlashScan™ products’ ability to activate outputs is increased in the same way. As a result, the time it takes a FlashScan™ panel to detect an alarm and turn on the notification devices is dramatically decreased. The FlashScan™ devices and detectors are 100% backward compatible with their first intelligent products. These devices have the ability to communicate in FlashScan™ or CLIP, without the need for DIP switches or jumpers. Even the original AM2020 can be upgraded without the need to replace devices. Conversely, all of their existing CLIP devices are 100% forward compatible with their FlashScan™ panels. Introduced with the AM200 (1980s). Polls devices one at a time in serial order. Limited to 99 detectors and 99 modules per SLC Loop. Compatible with entire line of Legacy controls. Permits the largest number of devices per loop in the industry (159 detectors/159 modules). Faster polling and response time – exceed worldwide code requirements (< 3 sec ).